The 1904 Olympic Gold Medal Winner In Marathon Running Won With Help From? There’s a good chance that you’ve never given much thought to the humble plumbing trap because, like many unseen elements of modern life, it quietly and perfectly performs the function it was intended to with nary a notice to us that it’s even doing anything at all. What function does the plumbing trap perform though? 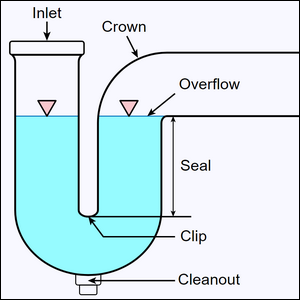 Despite the fact that you may have taken a sink drain apart to get a wedding ring out, the primary function of the trap is not to trap things going down the drain, but to trap things coming up from the drain, specifically, noxious sewer gas floating up from the attached sewer or drainage field. While traps can come in different shapes and designs, the image seen here (of the widely used P-trap found under millions of sinks around the world) shows very clearly how the trap works. When you use a sink, water flows down the drain, but a small amount of water is caught in the low point of the curving trap. This water acts as a seal preventing gases from passing up the drain and into the room. Not only does this keep nasty sewer smells out of your bathroom or kitchen, it also prevents dangerous gases from building up and potentially causing an explosion. Typically, the only time you even notice a trap’s existence is if you have to remove it to work on your plumbing (and smell the odors wafting up from the sewer line) or if a home has sat vacant for so long that the water in the trap has evaporated. In the latter case, if you intend to leave a property empty for a long time (months and months, not just a few weeks while you’re on vacation), it’s advisable to pour a small amount of cooking oil or mineral oil into the drain. This will form a thin layer over the water to prevent evaporation. Even if the property is occupied, this is also an advisable trick for seldom used drains, such as a floor drain in a basement laundry room or a seldom used shower in a guest room. Image courtesy of the Centers for Disease Control and Prevention/Wikimedia.